Last week, I wrote about how studying hard for exams is a terrible way of learning. 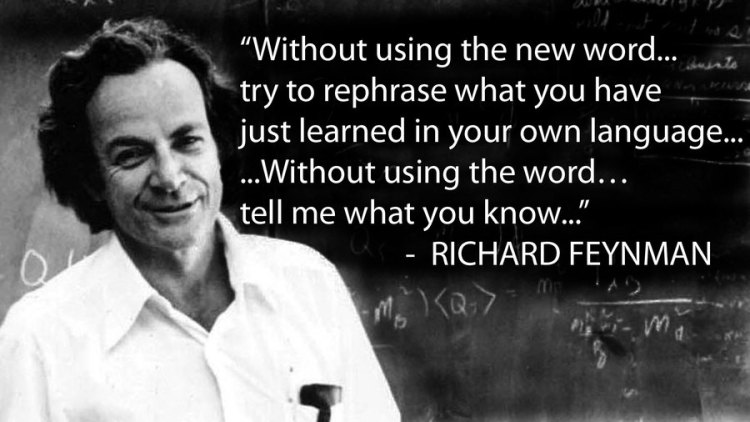 This week, to reinforce the idea, I shall draw reference to the Feynman technique of learning. 3. Review what you have done, and repeat steps 1 and 2 until you get it right. There are variations to the method. Some list down 4 steps, some re-order the sub-points slightly differently. But never mind about the intricacies of the technique (there are tons of stuff written on it, go search them out). More important is how the technique corrects our bad habit of learning things simply by remembering names. I have a confession to make. I'm a lawyer, but I cannot exactly recall the numbering of articles and clauses in the Federal Constitution. Ask me what Article 10 is about, and I will be scratching my head and taking a moment to answer. Plenty of times when I'm coaching juniors, I mistakenly refer to the wrong article. It's embarrassing, yes. But mistakes like that don't bother me. Nor should they bother you. "The next day, Monday, we were playing in the fields and this boy said to me, "See that bird standing on the stump there? What's the name of it?" He said, "It’s a brown-throated thrush. Your father doesn't teach you much about science." I smiled to myself, because my father had already taught me that [the name] doesn't tell me anything about the bird. He taught me "See that bird? It's a brown-throated thrush, but in Germany it's called a halsenflugel, and in Chinese they call it a chung ling and even if you know all those names for it, you still know nothing about the bird — you only know something about people; what they call that bird. Now that thrush sings, and teaches its young to fly, and flies so many miles away during the summer across the country, and nobody knows how it finds its way," and so forth. There is a difference between the name of the thing and what goes on." Why bother remembering the exact numberings of articles? They're irrelevant. If I ever need to cite them, I'll just need to pick up the Constitution and flip through the index. But what I do recall is the order of articles (fundamental liberties come first), and which articles come with many exceptions and hence, many clauses (e.g. freedom of expression). That's all I remember, and ever need to know. During exams, time is short. This is why students prefer to memorise statutes inside out and cases by heart even when statutes and case-list are provided for, because pausing to refer to them eats away precious seconds, and every precious second matters. This is stupid. In real-life, no one (except a really mean boss) will question you on the spot about the numbering of statute sections and spelling of case names. Such information is nothing more than meta-data and points of reference. You don't need to know what all the sections in all the statutes say. You just need to know which statute to look up for every key principle of law. 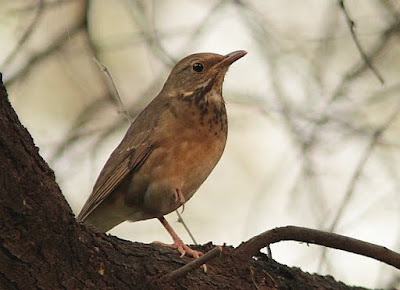 This is a brown-throated thrush. Whatever. I'll call it 'little birdie'. We all have limited memory space in our brains. So why waste it on irrelevant information? Reserve your memory for principles, not names. "I finally figured out a way to test whether you have taught an idea or you have only taught a definition. Test it this way: You say,'Without using the new word which you have just learned, try to rephrase what you have just learned in your own language. Without using the word "energy," tell me what you know now about the dog's motion.' You cannot. So you learned nothing about science. That may be all right. You may not want to learn something about science right away. You have to learn definitions. But for the very first lesson, is that not possibly destructive? I think for lesson number one, to learn a mystic formula for answering questions is very bad. The book has some others: 'gravity makes it fall;' 'the soles of your shoes wear out because of friction.' Shoe leather wears out because it rubs against the sidewalk and the little notches and bumps on the sidewalk grab pieces and pull them off. To simply say it is because of friction, is sad, because it's not science." Such advice doesn't just apply to science, but all kinds of learning - and especially law, where definitions occupy so much of its knowledge base. Don't start learning about the Constitution by listing down the articles in numerical order. That's no way to teach a kid - or anyone, for that matter. Start with a story about how terrible kings used to be. Draw diagrams to show how rights and obligations connect with each other. Explain in terms that self-explains itself (e.g. freedom of expression), rather than meaningless jargon (e.g. Article 8... no, wait, maybe it's 9... oh, bugger, doesn't matter anyway). This is the Federal Constitution. It has a lot of articles. Don't ask me how many. I did not know of Feynman's technique until recently. But does it matter? No. Professor Feynman didn't create it. He merely expounded the principle, and people named it after him. It's nice to know that my own learning philosophy aligns closely with his philosophy, and that I'm not alone. But even if the technique didn't have a name, I would still be using it, as I always have all these years. Even Albert Einstein once said: "If you can't explain it simply, you don't understand it well enough'. You can know all the names of things in the world, yet understanding absolutely nothing about how they work. Don't make that mistake. Forget about getting names right, focus instead on explaining concepts in ways that even a child can understand. amazng post, you always teach me something new, thank you, shared your post here http://lvivbrides.net with my friends!